Poznań is regarded as the second best city in Poland in terms of the share of green spaces in the city's area. Small and large green areas can be found throughout the city, some of them deserving particular attention. 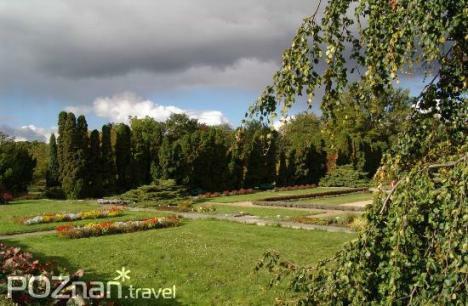 The Adam Mickiewicz University Botanical Garden is certainly an exceptional place. It is an oasis of greenery and a substitute of wildlife but also a basis for scientific research and environmental education. The Botanical Garden is situated in the District of Ogrody. It was founded between 1922 and 1925. It covers the area of 22 hectares and exhibits an impressive collection of over 7,000 species and varieties of plants from almost all climatic and vegetation zones of Earth. The Garden also a modern meteorological station and an air pollution monitoring station. Moreover, the Exhibition and Educational Pavilion was built, where exhibitions and lectures related thematically to the plant cover of the Earth are organized. Near Wojska Polskiego Street there is the Dendrological Garden of the University of Life Sciences. On 4.17 ha covered by the Garden you will find about 670 species, varieties and forms of woody plants, including both trees and shrubs found in Poland in their natural environment as well as numerous species of foreign origin, mostly Asian and North American. The Garden looks particularly picturesque in spring and early summer, when most of the cultivated trees and shrubs bloom. Between Małopolska Street and Litewska Street the Sołacki Park is located, considered to be one of Poznań's most picturesque parks. The park started being built in 1908, it was made available to the public in 1911; the finishing works lasted until 1913. To date at Małopolska Street a wooden tram stop shelter (so-called Green box), installed in 1913, and still exists. The park's stand is also interesting since in addition to domestic species, exotic trees grow here such as Canadian hemlock, swamp cypress, Douglas-fir. In the city centre, at Zwierzyniecka Street, the Old Zoo is located. Since 2009, it has been the park open for general use where animals still live such as monkeys, lemurs, and Komodo dragons. You can also pay and visit the reptile house and aquariums. The Wilson Park is Poznań's oldest public park situated between: Głogowska, Berwińskiego and Matejki Street, opened to the public since 1902. The park was developed on the land of the former nursery of decorative trees and shrubs; that is why it has been called the Botanical Garden - due to its large collection of plants. Currently, there are several hundred trees and shrubs here as well as numerous flowerbeds. 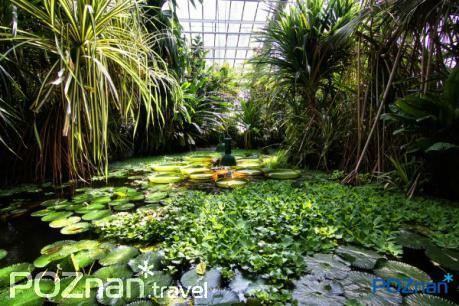 In three ponds located in the territory of the park, you can see water plants. The star-shaped fountain is situated in the central point of the park. In the Wilson Park, the Poznań Palm House is located. The first palm house was developed here between 1910 and 1911. In 1928, a new palm house was built on the occasion of the Universal National Exhibition. In the years 1983-1992, it was completely reconstructed and extended. 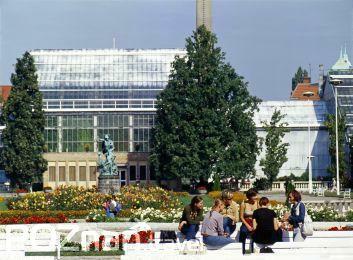 Nowadays, the Palm House covers 4,600 m2 and 46,000 m3, featuring ten exhibition pavilions (including the Aquarium Department) and two facility pavilions. The Palm House is a home to about 17,000 plants of 700 species from tropical and equatorial countries and also has a collection of exotic fish. The Citadel Park is considered as the central point in the layout of Poznań urban green spaces. The present Citadel Park is a former Winiary Fort - the largest fort of the ring of fortifications that had surrounded Poznań in the nineteenth century. After the war, the fort was demolished to accommodate a park that covers about 100 ha and serves diverse recreation purposes. It's a popular destination for walkers and outdoor enthusiasts. 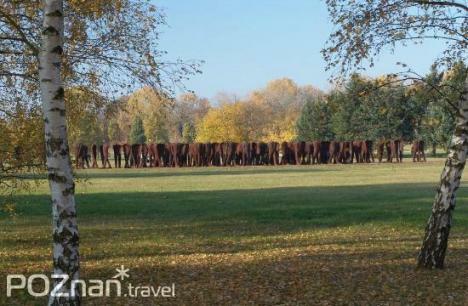 The Citadel includes numerous monuments, outdoor sculptures (including Magdalena Abakanowicz's piece 'NierozPoznańi'). For several years now, on the Sunday preceding the Palm Sunday, the park hosts monumental Passion plays. Nowadays, the restored remains of the fortress house the Museum of Arms and the Museum of the Poznań Army. The south-western slope of the hill features a complex of military, war and religious cemeteries. The traces of the Citadel's past can be followed along two educational routes: one regarding the modern buildings of the Citadel, and the other, the great circumference of Fort Winiary. You can easily return from the Citadel to the city centre by tram. The term 'Malta' - in a broad, generally accepted sense - denotes the areas surrounding Lake Maltańskie. These are areas of a varied landscape, interesting in both natural and historical terms. The etymology of "Malta' is related to the Knights of Malta, who, just as Joannites, settled in the area adjacent to the Church of John of Jerusalem, forming a "commandery' there. The Lake Maltańskie in its present form dates back to 1952, when it was formed by damming up the river Cybina. 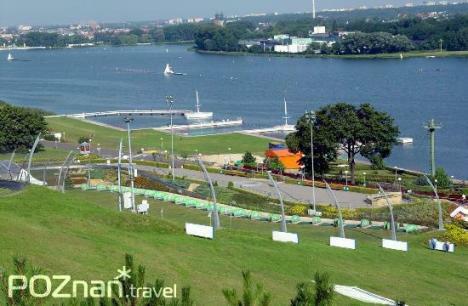 In the years 1980-1990, the reservoir basin and its surroundings have been thoroughly modernized before the world canoe championships. Today, the lake is one of the world's best regatta courses for canoeists and rowers that boasts a truly magnificent setting. Right next to the lake is a year-round artificial ski slope and a toboggan run. The number of Poznańers enjoying their free time at Malta is on the steady increase - one can see more and more walkers (also those doing Nordic walking or walking with poles), inline skaters, joggers and cyclists. Beyond the finish line of the regatta course is a large forest complex including the Zoo. The New Zoo covers 117 hectares of beautiful, rich land located on so-called Biała Góra (White Hill). The central valley includes ponds with a total area of 16 ha, the largest of them covering 6 ha, which exceeds the size of the Old Zoo. Animals - as far as possible - are exhibited on vast runs in conditions resembling their natural habitats. Particularly noteworthy are the birds of prey represented by more than a dozen species. 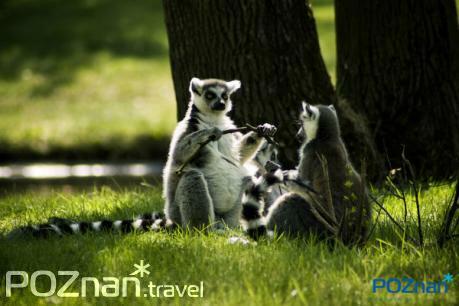 Attractions of the Zoo also include animals rarely shown in Polish zoos such as a white rhinoceros and snow leopard. Since 2009, you can visit the modern elephant house where 3 African elephants live. You can reach the Zoo by "Maltanka" narrow-gauge railway.